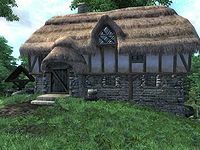 Weatherleah is a humble farmhouse between Skingrad and Chorrol (quest-related). *This character moves to Weatherleah and restores the home after the completion of the related quests. The once and future residence of the Jemane family was overrun by ogres years ago. Upon visiting Weatherleah, and before speaking with Guilbert Jemane to begin the Legacy Lost quest, the house is in very poor condition. The typical farm house has been ransacked. A small room to the right of the front door, possibly a small study or dining room at one time, has overturned bookshelf, tables, chairs and clutter strewn about. A charred body remains in the pass-through fireplace. The debris, as well as the bones left behind on the main floor, are evidence of a violent event or less-than-human occupancy. Upstairs are two bedrooms. The first containing only clutter. The second has a single bed, a cupboard with groceries and a bottle of Tamika's West Weald wine sits upon a small table in the corner. A skeleton lies at the foot of the stairs up to the attic area. The third floor attic area holds only human remains. Numerous skulls and a skeleton again indicate acts of depravity; not surprising considering the cannibalistic tendencies of ogres. Once the Jemane brothers are reinstated in their home, and the Sins of the Father quest is progressing, the brothers work to restore the house. Furniture is righted and repaired, clutter is stowed away, and housekeeping begins. No new items of interest are added to the house after the brothers begin repairs. Outside, fences are mended, and the brothers try their hand at farming, planting a garden of carrots, potatoes, and lettuce. Weatherleah is restored to its former glory when you receive the stage 20 quest update during Sins of the Father, e.g. when you approach Redguard Valley Cave. By rushing into the cave, it is possible to avoid the quest update, which will trigger a bug and make Weatherleah ruined for the rest of the game. Esta página foi modificada pela última vez à(s) 23h08min de 31 de maio de 2015.